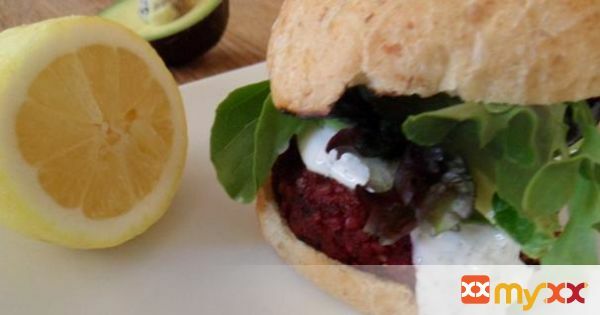 Vegetarian "burger" made with beets, lentils and brown rice. Topped with lemon-dill Greek yogurt sauce! Delicious and nutritious! A must-try! 1. Start by preparing the lentils and brown rice. Follow the instructions on the package. 2. I typically do a 2:1 water-to-rice and water-to-lentils ratio. Pour rice, 1 cup of water and a dash of salt in a saucepan and bring it to a boil. 3. Once boiling, reduce the heat to medium-low and simmer for 45 to 50 minutes. 4. Pour lentils into a small saucepan with a drizzle of olive oil. Heat to medium and stir lentils around frequently, cooking for about 4 minutes. 5. Add 1 cup of hot water to the lentils, bring to a boil then reduce heat to medium low and allow to simmer about 35 to 40 minutes. 6. While the rice and lentils are cooking, prepare the lemon dill Greek yogurt sauce. 7. Combine all ingredients in a bowl and stir until well combined. 8. Check the sauce for taste and add salt if necessary. 9. Peel and coarsely chop a medium-sized beet. 10. Pulse about 10 times in a food processor until beet is shredded into ½” slices. 11. Measure out 1-1/2 cups of beet and set the rest aside for a different endeavor (like beet cake, beet brownies, or more beet burgers!). 12. Keep 1-1/2 cups of the beet in the food processor, then add the ground cumin, yellow curry powder, dill, salt and garlic. 13. Pulse a couple of times to combine. 14. Once the rice and lentils are cooked, add them to the food processor. 15. Pulse about 8 to 10 times until well combined. 16. The end result looks like ground beef, it’s crazy. 17. The beet mixture should hold together very easily. 18. Form patties with your hands. 19. Heat 2 tablespoons of olive oil in a cast iron skillet over medium heat. 20. Once the skillet is hot, space your patties out on it. 21. Cook for about 3 minutes before carefully flipping to the other side. 22. Cook an additional 3 minutes. 23. Continue flipping and cooking until your patties form a nice golden-brown crust on the outside. 24. Serve on your favorite bun with a heaping scoop of the lemon dill Greek yogurt sauce and your favorite toppings, such as avocado, tomato, lettuce, pepperoncinis, etc.